Within the aBPM excel sheet one can define the parameters for every attribute in the param column. 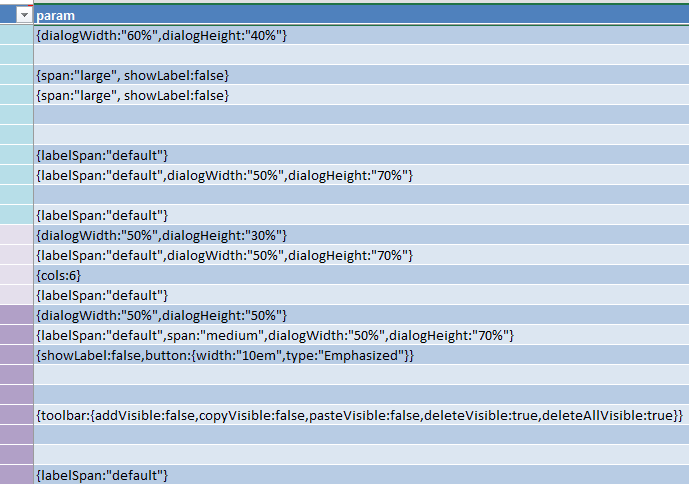 Mainly the label and field spans as well as dialog width and height can be defined here. But also table toolbar visibilities and row counts within TextEdit fields are set in the param column. Sometimes one can face situation in which one want to change this params during runtime, e.g. if the UI is opened on a mobile device. This becomes possible within the callback implementation of aBPM and will be shown in the following coding examples. Note: The params belong to the BO meta data. Therefore, it is not possible to set different params e.g. for different rows of a table. They will always have to use the same BO meta data.